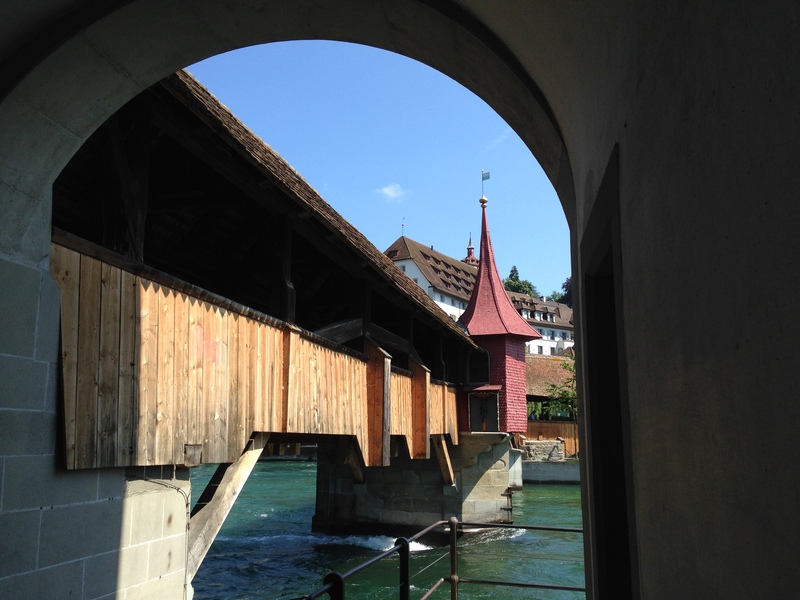 Last Christmas I received a wonderful present: Come to Lucerne! Last Christmas, I received a very kind present from my niece and her friend: A voucher to spend a day with them in their town Lucerne. I redeemed that present on a hot and sunny Sunday in June 2015. Early in the morning, I took the train to Lucerne investigating some background information using a small guide book and Dr. Google. This is what I found about the history of Lucerne. Take it as a summary written by an interested traveler. The origin of the name “Lucerne” is under debate: It may come from the Latin word “lux” (town of “light”). Or from the celtic word “lozzeria” (“settlement on swampy ground”). 8th century: A small monastery was built where the Hofkirche is located today. It was later called Monasterium Luciaria. 1178 – 1291: The monastery belongs to the powerful Abbey Murbach located in the Alsace, north of Basel. In 1291 Murbach sells the monastery to the Habsburgians. Beginning of the 13th century: The trade route across the Gotthard opens up, after the Schöllenen – a steep and narrow gorge – had been overcome by building the devil’s bridge and a hanging wooden gangway. This gives business to the city located where the river Reuss leaves the lake of four cantons. Around 1300 Lucerne has about 3000 inhabitants. Until 1386 the town fights against the Habsburgians that try to add Lucerne to their possessions (after Rudolf von Habsburg has added Austria in 1278). In 1332 Lucerne teams up with the other three cantons (or “Waldstätte”) bordering the “lake of four cantons” (or “Vierwaldstättersee”). The confederation of cantons successfully expels the Habsburgians by beating them in the battle of Sempach in 1386. (The Habsburgians were not lucky in Switzerland – in 1415 they also lost their homeland Argovia). In 1520 Lucerne does not follow the reformation, but remains catholic. They lead the catholic against the protestant cantons that are defeated in 1531 (battle of Kappel). In 1712 the protestant cantons beat the catholic cantons (war of Villmergen) and they beat them again in the Sonderbundskrieg in 1847 (Jesuits banned from Switzerland until 1973). In 1848 the Swiss federal state emerges, and it is not Lucerne, but Berne that becomes the capital of Switzerland. In 1859 the railway reaches Lucerne and brings travelers from abroad. Some of the travelers are famous. Thomas Cook with Miss Jemima stay here in 1860 (“our grand finales… were… watching the sunrise from Mount Rigi”). 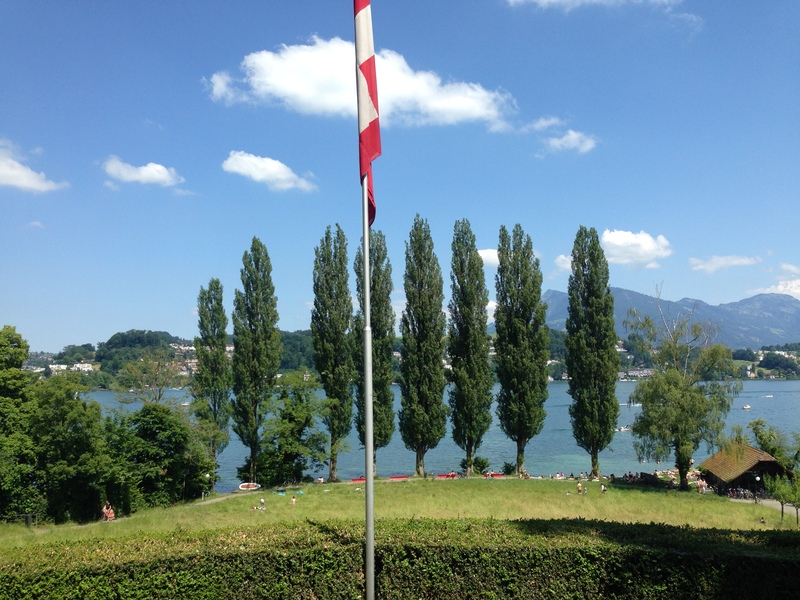 Mark Twain comes to Lucerne on his tramp abroad in 1880 (“… reached Lucerne about ten o’clock at night. The first discovery I made was that the beauty of the lake had not been exaggerated.” ch 25), Queen Victoria wants to recover from the death of her husband Albert in 1868 (“… with her fourth daughter Princess Louise, aged twenty… (Victoria traveled) incognito to Lucerne as the Countess of Kent. There she stayed in the Pension Wallace where she lived in relative simplicity… Victoria made expeditions to the Rigi and Pilatus… Victoria had… agreed to receive the Dowager Queen of Prussia who was also about to visit Lucerne.”). 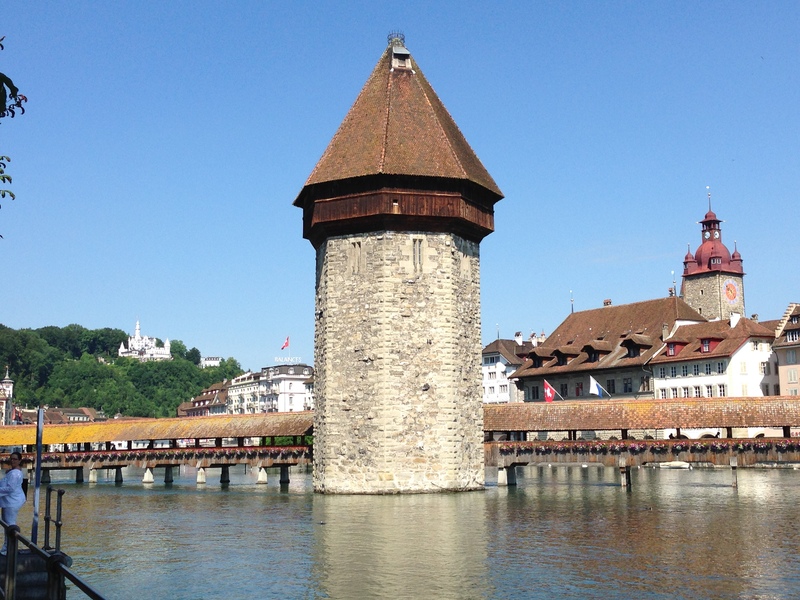 In 2013 Lucerne counts about 5 Mio visitors. Locals complain about the traffic – but tourism is an important factor for the economy here. My train arrives shortly after nine in Calatrava’s train station. My niece and her friend pick me up and we have a coffee near the lake. They propose a guided city tour, lunch, a walk along the lake and a visit of the Richard Wagner museum. Great! Off we go! 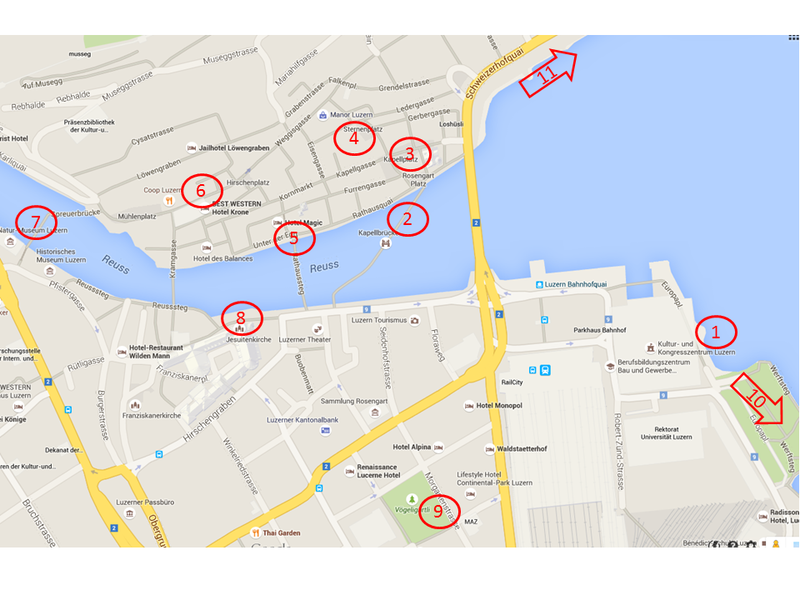 Here is the map of Lucerne taken from Google maps. The guided tour includes the Culture and Congress Center (1), the Chapel Bridge (2), the Chapel Square (3), the Sternenplatz (4), the townhall (5), the line of squares and narrow streets in the old city center (6, e.g. the Weinmarkt), the Spreuerbrücke (7), and the Jesuit church (8). We did not visit the Hofkirche and the Lion’s monument (11). Let me summarize some of my take aways. The Hofkirche (11) with its twin towers is what has been built and rebuilt at the location of the 8th century monastery. The church is a little off the city center. Up to the 19th century, a wooden bridge connected the Hofkirche to the city center and the Peterskapelle. Then the small bay separating the chapel from the Hof Church was filled and the bridge was demolished. The Chapel Bridge, built early in the 14th century, is called “Chapel” Bridge, because it ended at the Peter’s Chapel (Peterskapelle). The Peter’s Chapel bordered on the lake then. In the 19th century, an embankment was added here and the bridge was shortened, but kept the name “chapel bridge”. The cycle of paintings describing religious topics was added around 1600. After having burnt in 1993, the bridge has been reconstructed including some of the paintings. Some of the black burnt paintings have been left under the roof of the bridge to remind us of what had happened (was it really a cigarette thrown away?). 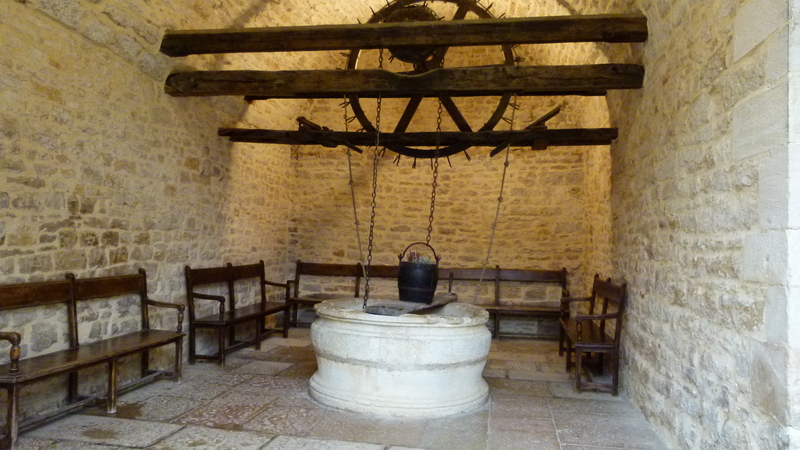 The Chapel Square was the place where goods were loaded and unloaded and tolls were paid. A line of white cobble stones shows the location of the former toll house, before it was removed. On the Chapel Square there is also the Fritschibrunnen, named after the head of the Saffron Guild that kicks off the Lucerne carnival here. The Sternenplatz is dominated by the Restaurant Fritschi that shows Fritschi and his family. My foto shows the facade of the neighboring house that hosts the Stadtkeller. We stroll through the narrow streets. Small shops invite for shopping, but today they are closed. 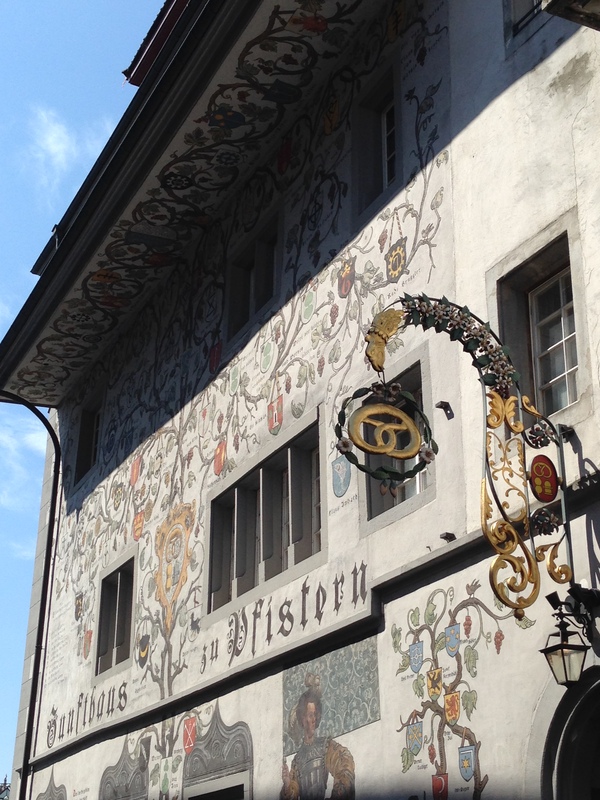 We reach the Kornmarkt with the townhall that has been built around 1600 in Renaissance style. It is topped with a hipped roof (traditional “Walmdach”). Renaissance and a traditional hipped roof – this is a combnation that I have never seen before. Just opposite of the townhall, there is this old bakery with the traditional bretzel announcing it. Today the house hosts the restaurant Pfistern. It takes the name from the Latin word for baker (pistor). Our guide keeps on praising this restaurant. The bridge is interesting for the paintings showing a Danse Macaber (“Totentanz” in German). Also the water level of the lake is regulated here. From the Spreuerbrücke there is a view of the Château Gütsch that has recently been reopenend. We round off our tour in the Jesuit church. It is a baroque hall church. Since 1973 the Jesuits have been back in Lucerne, after having been banned after the Sonderbundskrieg in 1847. 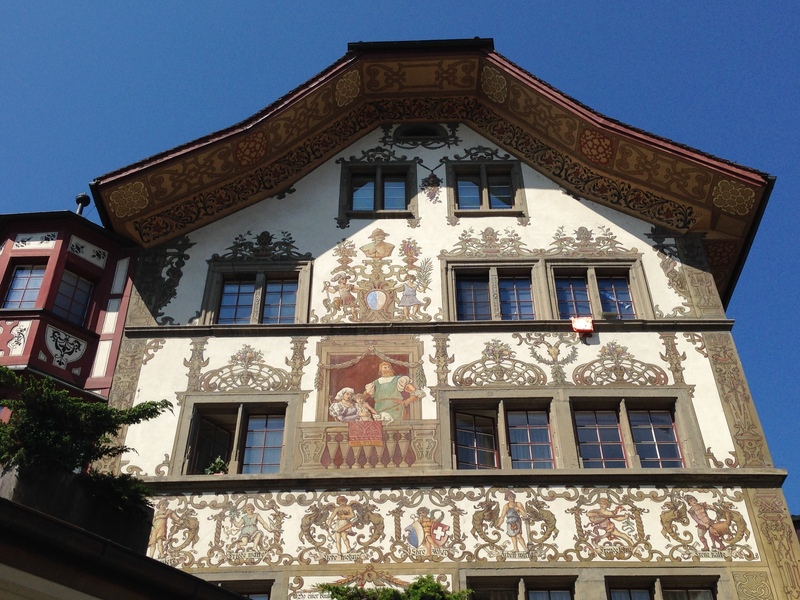 The guided city tour gave great insights into the city of Lucerne – most of it was new to me. It is now almost twelve and we are hungry. We are hungry and try to find a free table for three in one of the restaurants bordering the river Reuss. No way. Already before 12:00 all tables are taken. My hosts decide to look for a more quiet and less touristy place and take me to the Bellini Ristorante Ticinese in the shady Vögeligärtli close to the protestant Lukas Church. We enjoy the cool shade of the trees and the company of locals. I have a great Risotto con ragú de carciofi (half portion) – the menu selection of specialties from the Ticino is very enticing and I will surely come back here. This restaurant deserves an entry in Tripadvisor. The sun is burning. It is a beautiful Sunday. We stroll along the lake. 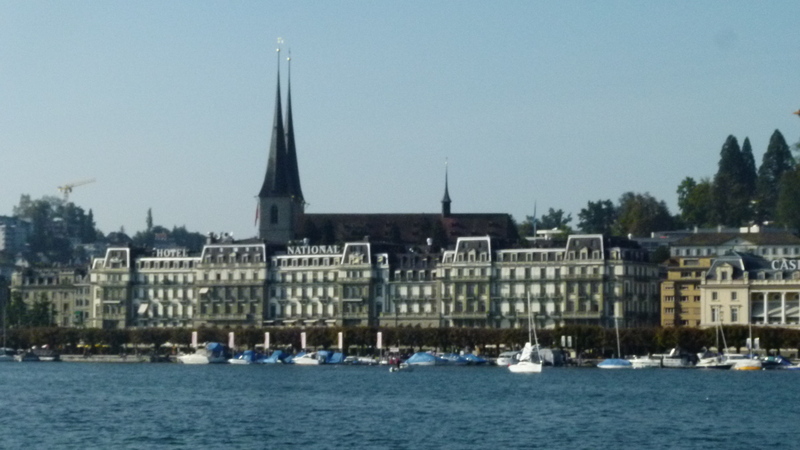 I believe the whole town of Lucerne has come here to enjoy the sun and a refreshing bath in the lake. A pity that we have no bathing costumes with us. We are sweating. There is a stand on the way that refreshes us with cooled water and cold ice cream. Finally we reach our target, the Richard Wagner museum. 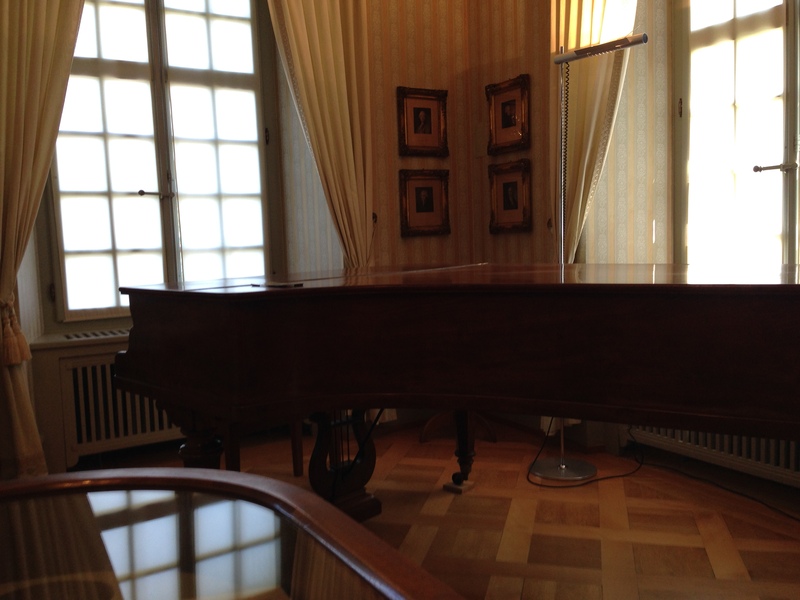 There are no visitors in the Richard Wagner museum (too hot…). At the cash we are welcomed by an enthusiastic lady from Australia. In Swiss German with an Australian touch, she tells us, what we are going to find: Richard Wagner lived in this Tribschener Landhaus for six years. He came here with his second wife, Cosima, the daughter of Liszt. When they arrived the two of them were not yet married… a scandal in the catholic town of Lucerne. They married after their son Siegfried was born. Wagner worked and lived on the ground floor, Cosima with the five children stayed on the first floor. 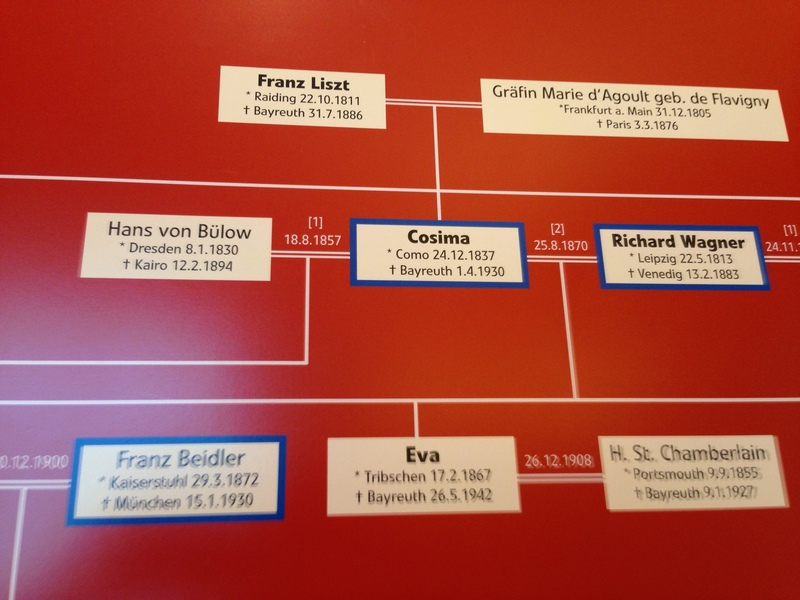 There was a drama with Franz Beidler, son of Isolde and Cosimas grandson. Isolde was deemed of as being the daughter of Hans von Bülow (a famos conductor and Cosima’s first husband). But as a matter of fact, she was the first daughter of Richard Wagner. Isolde fought to be acknowledged as Wagner’s daughter, but without success. Hence Isolde’s son, Franz Beidler was also never acknowledged to be Richard Wagner’s grand-son. This drama is layed out on the first floor. Under Hitler Franz Beidler left Germany for Switzerland and became Swiss. He was the general secretary of the Swiss Author Associaton SSV (Schweizerischer Schriftstellerverband). However in 1970 the group Olten split off – members were among others Max Frisch and Friedrich Dürrenmatt. 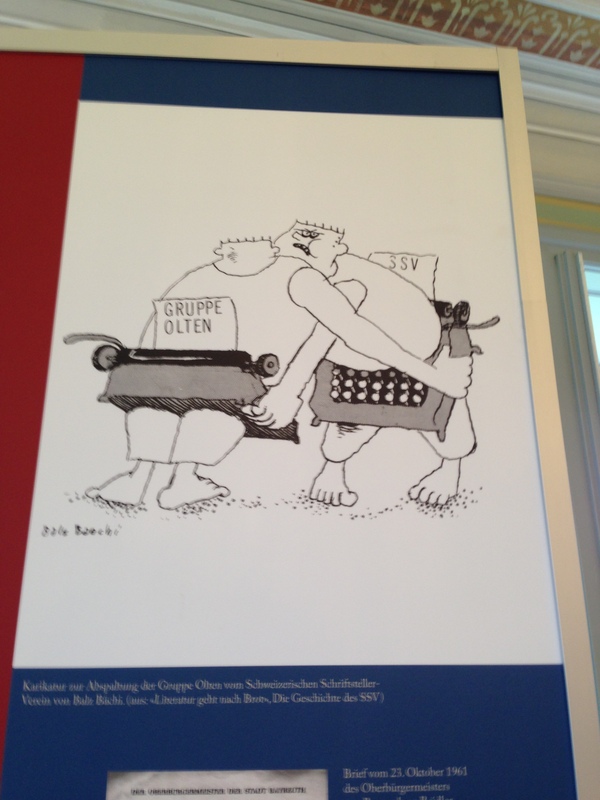 This cartoon shows the two groups wrestling – yes, it was the time of typewriters – do you remember? Lucerne – the sink of Switzerland? – No, surely not today! Sometimes we joke and say that Lucerne is the sink of Switzerland. It is raining here more often than in other places. But today Lucerne must have been the hottest place in Switzerland – the sun has been baking us. We take the bus back to the city center and enter the Möwenpick restaurant (inside) to cool down from the hot sun. I enjoy a frozen coffee (Ys-Kaffi). Then my hosts take me to the train station (built by Calatrava, again I am jealous). I catch the 5 o’clock train and an hour later I am back in Basel. Good-bye, thank you… and next time you will join me in Basel! 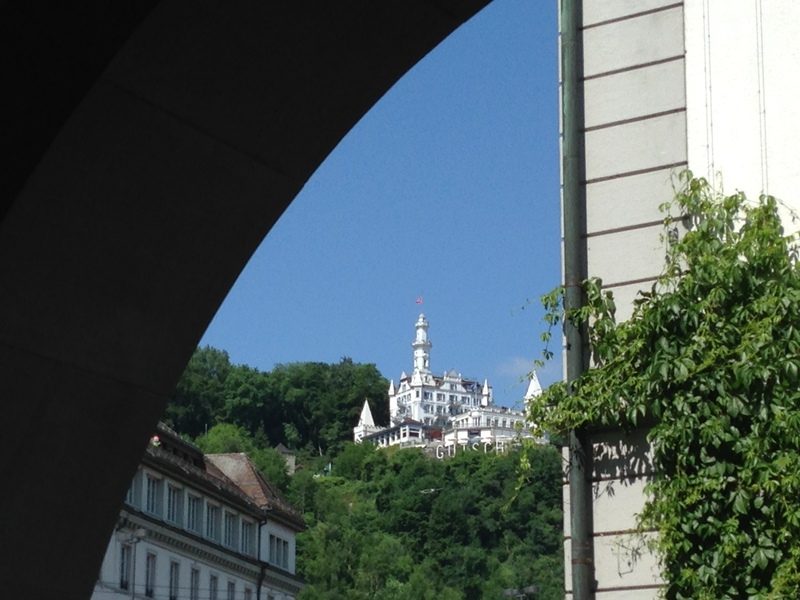 There is plenty to see – perhaps we should plan to visit the Abbey of Murbach that ruled over Lucerne some 800 years ago. 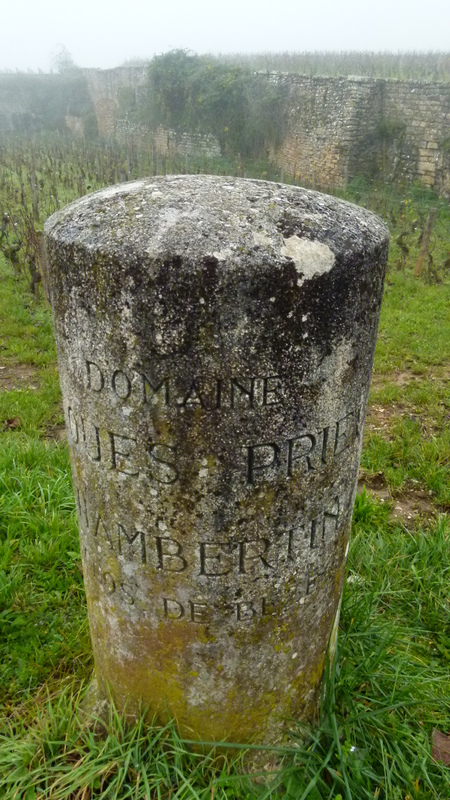 We stop at the smallest vineyard, Domaine de Jaques Prieur, just next to Chambertin Clos de Bèze. 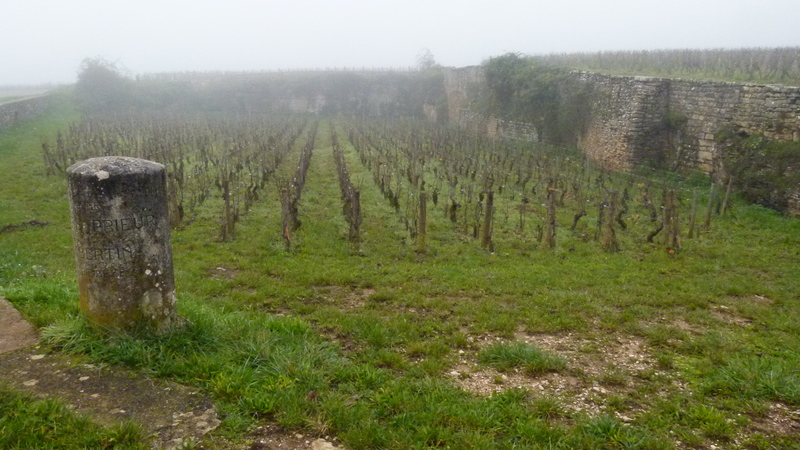 Larissa always comes back to this tiny vineyard, when she visits Burgundy. It is now hiding in the November fog. Nearby we try some of the few Pinot Noir grapes that had been left – no one else will pick them, as it is mid November. 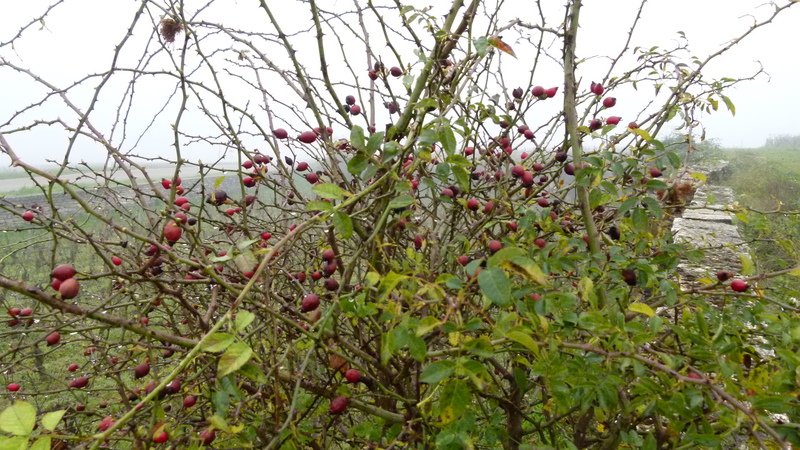 We also enjoy seeing the rose bushes carry rose hips. Roses are often planted along the vineyards as an early indicator for diseases. Yes, it is autumn – mid November. We soak in the famous names such as Château de Chambertin. … in the November fog. It is great to be here with Russian friends and exchange about our wine terminology. For instance how to put the sense of “tannin” into an image. I compare tannin to “fur” tickling and biting my palate (I call this a “Pelzli” in Swiss German – it is not an official term). My Russian friends also feel that tickling in their palate and describe it as a knitting woman (“вяжущая женшина”). 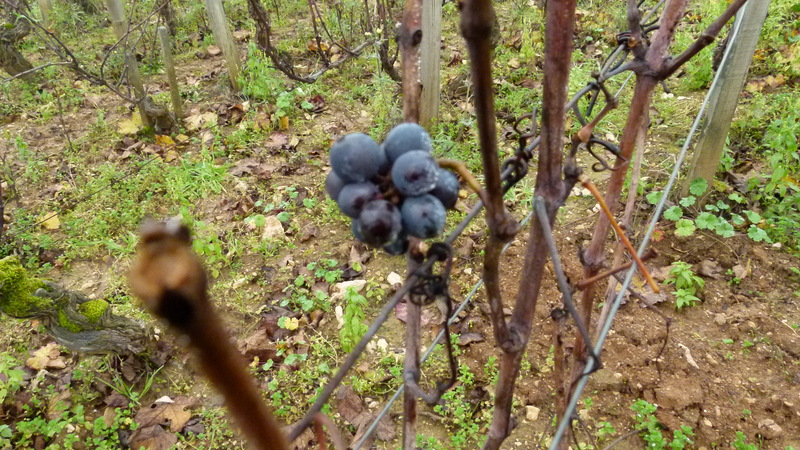 Yes, the full bodied and sometimes tannic wines – let us look at some of the factors that have shaped Burgundy. The wines of Burgundy mostly grow on east and south-east facing slopes of the Saône valley, capturing the sun early in the morning and benefiting from the warm temperature retained during the day. The slopes are shaped by a fault line that brings layers of various maritime epochs to the surface. The resulting structure of the slopes is very varied and has been studied by swarms of geologists – they found calcium from defunct shellfish and a mixture of limestone and marlstone, sometimes iron. Pebbles often retain the heat (the wines are then called “Les Cras”, “Les Caillerrets” or “Les Perrières”). Already in the 12th century, monks eagerly explored the potential of the terrain to find the best places for their vines – and wines. 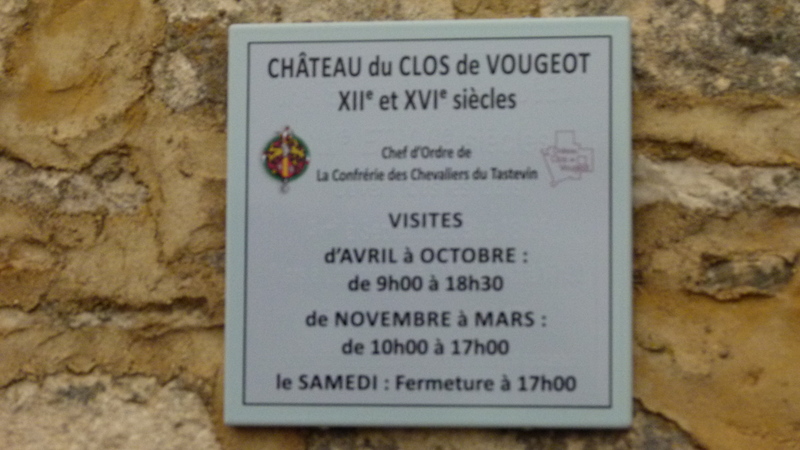 As a matter of fact, wine growing goes back to Roman times (mentioned first around 300) and to the early Burgundy empire (in 630 the duke gave a large domain to the Abbaye de Bèze which continues to live in today’s Clos de Bèze). Around 1400 Philippe the Bold (then duke of Burgundy) ordered the Pinot Noir grape to become the only red grape in central Burgundy. After the French revolution (1790) the ground belonging to the abbeys was sold – and this is why ownership of the vineyards is split today: 4900 domains, 115 trader-wine makers (negociant-éleveur) and 19 cooperations. The terrain shapes the quality of the wines: East/east-southward facing slopes, altitude (less foggy higher up), ascent (the steeper the better), ground (more limestone than clay, sometimes pebbles) are some of the factors. There are about 2% Grand Crus wines, about 11% 1er Crus, and the rest are either labeled AOC communales or AOC régionales. The main grapes are Pinot Noir for red (thanks to Philippe the Bold) and Chardonnay for white. I also learn that “Passe-Tout-Grain” is a wine blended from Pinot and Gamay (prevailing in Beaujolais)… this is what we call “Dôle” in the Valais (Switzerland). 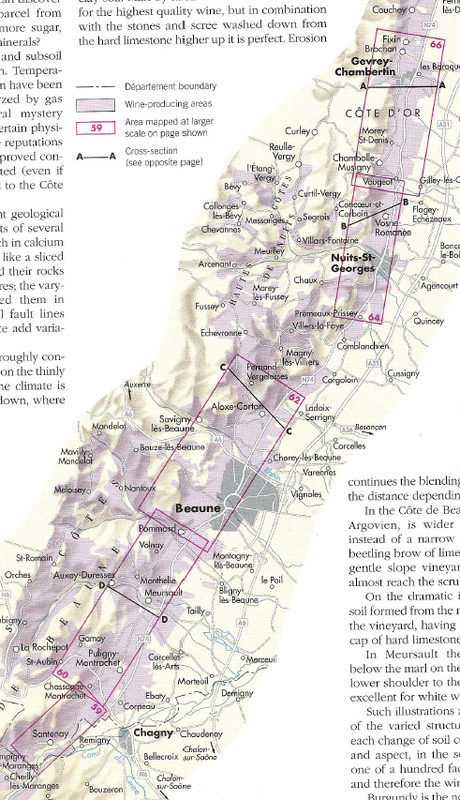 Source: Hugh Johnson and Jancis Robinson, The World Atlas of Wine, 5th edition, Beazley 2005, p. 55 (also the summary overview has been mostly extracted from Johnson and in addition from “petit guide: Les vins de Bourgogne”, Aedis éditions 03200 Vichy, Florence Kennel et alii). 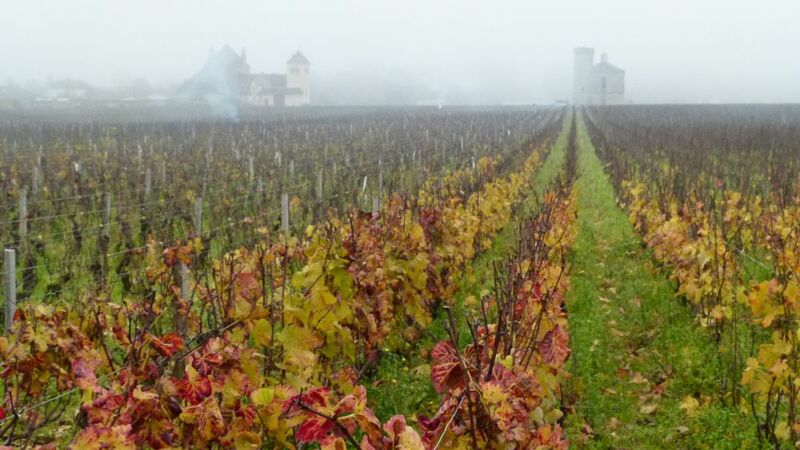 When driving home from Beaune I found out that Burgundy is only a three hours’ drive away from my hometown Basel. Well, in early medieval times Basel was even part of Burgundy*. 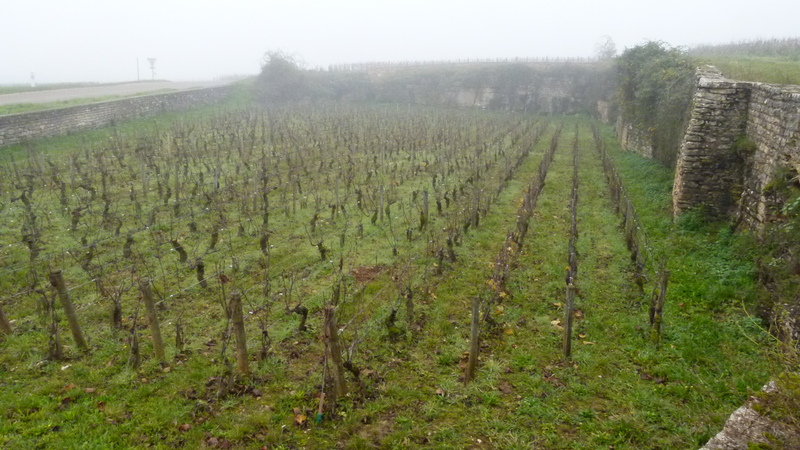 I decide that I will not wait another thirty years to go back to Burgundy. 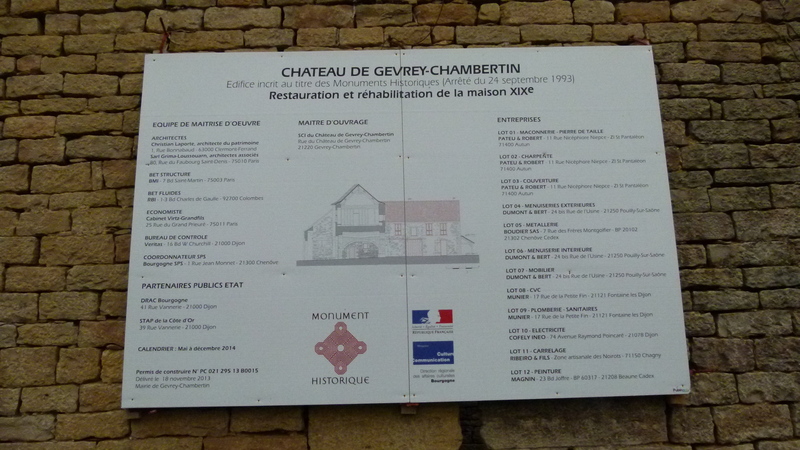 And maybe then – they will have reinstalled the charming Chambertin panels? * around 1000 AD, Basel was part of the kingdom of Burgundy, see “historischer Atlas der Region Basel”, Merian Verlag 2010.